Party food ..need I say more. We put in a lot of efforts to organise parties, be it for kids or friends. The food prepared needs to be interesting, non messy as well as quick to make. So, the theme for October is Party Food. Bring in your cakes, snack varieties, muffins, cookies, mocktails & other beverages, desserts, Icecreams, etc or even a full course meal that would like to serve during parties and we shall have a one-stop place for Party food. 3) Mail me the following details - Subject: WYF- Party Food, your name, dish name and link to the post to easycrafts@gmail.com by 31st October '08. I will pick up the picture from your blog...you neednt send it. The roundup would be published during the first week of November. Please rush in your entries for the WYF:Soups/Salads/Starters event as today is the last date .. No late entries please as I will be posting the roundup in a day or two. Heat the ghee and add the wheat flour to it. Mix well for 5 minutes and add the all purpose flour to it. Keep mixing for 10 minutes till you get start getting nice aroma. Add the food colour to it and slowly add 3 cups of hot water to it. Keep stirring to ensure there are no lumps to it till everything comes together as a big ball. Now add the sugar, cardamom powder and the nuts to it. Transfer it to a greased plate and cool for some time. Now cut it into desired pieces. Make a soft dough of the flours and salt with water. Let it stay covered for atleast an hour. Make small balls and roll out into thick rotis. Spread some water on both the sides of the roti and stick it to the tava. Now turn the tava and cook on low heat till the roti falls down..make sure you dont burn the roti. Spread some ghee and serve hot with side dish of your choice. Mix all the ingredients well and keep heating it till it reduces to less than half. Cool and pour them into kulfi moulds and freeze for a day. Run the moulds under water for a minute to easily remove the kulfi from the mould. A small reminder that the WYF:Soups/Salads/Starters event ends on the 30th Sept. The roundup would be out on 1st Oct. So please rush up and send me your entries by 30th Sept. Mix all these together with water to get a thick batter and let it stay covered for 1 hour. Heat tava and spread a ladle of the batter in circular motion. Cook with litte oil and then turn over to cook on the other side as well. Made parota for the first time following Cham's recipe and it was a perfect one..
Make a soft dough of the maida, salt, baking soda and hot water. Knead well and spread the oil over it. Keep covered for atleast 2 -3 hrs. Make small balls of it. Roll out a ball into the thinest possible chapati. Spread some oil all over it and fold it into pleats like fan. Now roll it up to get a spiral shape. Press with less pressure to roll out and then cook it on hot tava in medium flame with some oil. Allow it to cook on both sides to get brown spots over it. 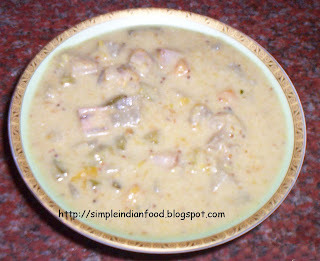 My version of Aloo-Matar Kurma (without onion and garlic) recipe . 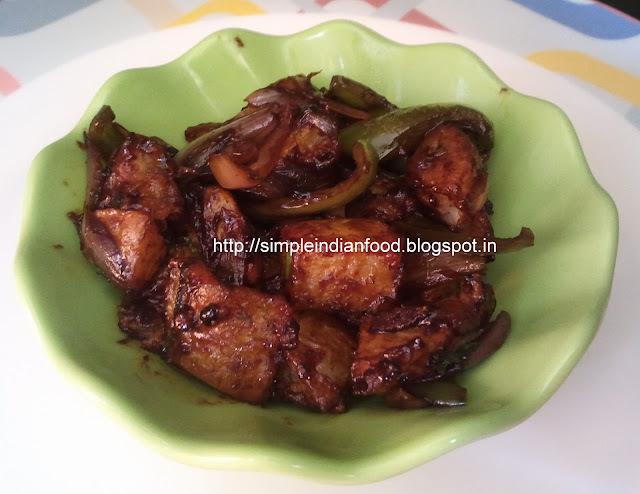 Spread a drop of oil over the idlis. Cut the idli in four/nine pieces as required. Add the powder/podi of your choice and mix it well. Normally these are fried in hot till golden brown to get crispy idlis. But for the less oil version, simply roast these on the dosa tava till it gets crisp on both sides. Serve with chutney of your choice or just like that. This recipe is adapted from Sunshinemom's version at Tongue Ticklers blog with slight differences to suit my taste buds. Wash the dals and rice and soak them in sufficient water for 15 minutes in seperate containers. Heat ghee, add the cardamom, cinnamon and bayleaf. Add the rice and dals (after draining out the water) and mix well. Add veggies, masala paste, salt and 6 cups of water to it. Pressure cook it till done. Garnish with coriander leaves and add more ghee for taste. This goes off to the SWC:West Bengal event hosted by Lakshmi. Soak the rice overnight or for atleast 4 hrs and grind it to a smooth batter with coconut. Add salt to it and enough water to make it very thin. Heat tava and add a drop of oil in the center. Now pour a laddle full of batter in the center. Dont spread it with the ladle...rotate the pan to spread the batter into a circle. Cover and cook for 2 minutes. Slowly take it off from the tava and serve hot with chutney of your choice. Recipe source: Lata from La Gourmet Chef with slight changes to suit taste buds. Mix the potato cubes, corn flour, maida, salt and pepper by sprinkling some water. Deep fry it and drain out the excess oil on a tissue paper. Heat 2 tsp oil and add ginger paste, capsicum and cook for 2 minutes. Add the sauces, pepper, little salt and mix well. Add very less water and allow it to cook for 2 minutes. Switch off the stove, add coriander leaves and fried potato pieces, Mix well and serve immediately. This is my second entry to the WYF:Soups/Salads/Starters event under the starters category. Grind the chickpeas without adding water. Add the rest of the ingredients except oil and bread crumbs. Make small balls and flatten them. Roll them in bread crumbs and cook on tava with little oil. Cook on both sides till it becomes crispy. Make a stiff dough of all the ingredients leaving out oil/ghee with some water. Let it stay covered for 10 minutes under a wet cloth. Make balls of it and pat it on a greased plastic sheet. Dip fingers in water to ease patting. Make a small hole in the center. Cook it on hot tava with some oil in the sides and center till brown spots appear on both sides. Heat oil, add mustard seeds and when it splutters, add the okra to it. Cook till okra is done and add it to the curds. Add the rest of the ingredients and mix well. Refrigerate for some time before serving. Sending this over to Zlamushka's Tried and Tested Event. Archana of Archana's Kitchen posted this healthy and instant dosa variety idea some time back. It was soft as well as tasty. Mix all the ingredients except oil with sufficient water to get a batter slightly thinner than the normal one. Let it stay covered for atleast 15 minutes. Heat tava and spread a ladle of the batter all over..It would look like rava dosa. Spread some oil and when it gets cooked, turn over and cook on the other side as well. Sending this over to WBB series started by Nandita's and guest hosted by Aparna of My diverse Kitchen with the theme of Grains in my breakfast. Also sending this over to JFI: Whole Grains event hosted by Suganya of Tasty Palettes. This recipe was sent by Cookspot for the Powerless cooking event. I just skipped the onions in the recipe, added coriander leaves and substituted green chillies with green chilli sauce. Mix all the ingredients except oil with water to get a batter that is neither very thick nor very thin. Heat tava and pour the batter from outside to inside. Spread a little oil over the sides and the holes in between. When cooked, turn over slowly to other side and cook for a minute. Have added a blogroll to the right sidebar..Please do check if your blog is there or else do put me a word and I will include it. Heat coconut oil, add mustard seeds and when it splutters add the curry leaves and chopped vegetables. Add a little water and cook it till soft. Add salt, grated coconut and mix well. Grind the dal, coconut, salt and green chillies together. Heat oil, add mustard seeds, blackgram dal, asafoetida and curry leaves. When it splutters add it to the chutney and mix well. Drain out all the water and grind it in the mixer to get a coarse powder. Add the cardamom powder and jaggery to it and grind again to get a thick batter. Heat oil and when hot, take a big spoon full of the batter and pour it slowly in the oil. It will spread by itself to a round. Let it cook on low flame till it puffs up. When it starts turning brown, turn and cook on other side as well. Appam, Jalebis and Jhangri are my entry to Mythreyee's Sweet Series:Deep fried or steam cooked event.